Imagine that you’ve got front-row seats to a championship basketball game. Your team is trailing by two points, and the clock is ticking down to the final seconds. The entire crowd is on its feet, and the roar is almost deafening as your team advances down the court to take one last shot at championship glory. The ball is passed to your star forward, who is positioned perfectly to sink one of his legendary three-pointers and win the game. Time slows down as you see the ball make its way across the court as if you were watching the final seconds of a movie in slow motion. You can almost feel the swish, the victory, the euphoric exultation. But your star’s gaze is fixed on the scoreboard. Rather than taking that perfectly rehearsed shot, the ball bonks him in the head and he crumples to the court. You are utterly stunned. Your team just lost the most important game of all time. The team lost because it focused on the scoreboard instead of the game. If you think about it, having your eyes fixed on the scoreboard is a bad recipe for winning at any type of sport. The same is true in business – if all we care about is the scoreboard (revenue), we’re going to do a poor job of executing important plays. No swish (so to speak), no exultation. Why? Because winning is more than revenue. Winning takes people playing a great game. Now, before I go too far out on this limb, let me be clear. I’m the CFO here at RevLocal. Revenue is important. I like revenue. But revenue doesn’t generate itself. It’s created by people executing with excellence and creating value — just like beautifully executed three-pointers. Have you ever worked for a completely revenue-focused organization? To the point that they spend a ton of time watching the scoreboard, to the detriment of playing the game with excellence? Chances are if the answer is yes, you either left or would like to leave because those types of companies don’t win in the long run. They tend to have “political environments” where people with big egos work hard to play off one another’s weaknesses for personal gain. Here at RevLocal, we’re not perfect, but I’m happy to say that we work really hard to turn that paradigm on its head. We strive to win by playing off our team members’ strengths — for mutual gain. We want to win and we want our clients to win. How? There are lots of ways, of course, but let me describe just three. Why is this important? Because it actually facilitates a team’s ability to execute with excellence. Humility allows us to have both self-awareness of our own strengths and weaknesses, and an appreciation of the unique talents of others on the team. A humble member of the team is coachable, and accepts constructive criticism, knowing it will make them better. On the flip side, a truly humble person will have the courage necessary to point out errors made by a colleague as well, and they’ll do it for the other person’s good — not their own benefit. 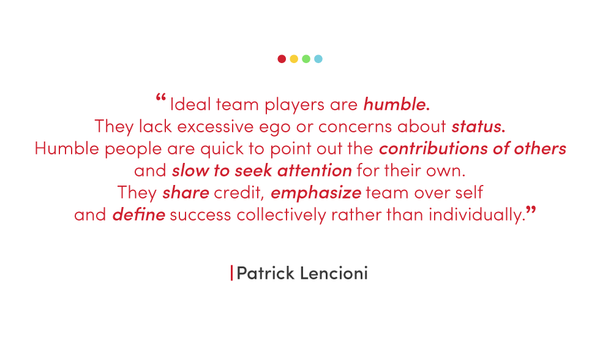 Humility helps us all — and our teams — to become the best versions of ourselves. When a group of people with complementary talents and perspectives come together to solve problems, the solutions are better, richer. It’s that winning combination of elements (and here my wife might mention chocolate and peanut butter) that just makes things better. Of course, great chemistry isn’t just about diversity. It’s also about those intangibles that keep life engaging – like shared goals, hard work and grit. It’s when all those qualities your team needs to play that dream game fall into place, and you do things together you never even dreamed were possible. Have you ever noticed that great cultures all have something in common? They all have a particular way of bringing out the best in people. When people flourish, the team wins — in sports, in business and in life. Treating people with dignity and respect is important, but that should really just be a baseline, a minimum acceptable standard. A great culture truly honors people and helps them to grow and improve both professionally and personally. When I joined the senior leadership team at RevLocal, I was struck by one of the traditions of the group. At the beginning of our monthly executive meetings, we go around the table and each member of the team shares what’s going on in their lives – their joys, struggles and sorrows. Kids headed to college. Hardships being on the road for work. A new grandson being born (yeah, that was me). The result? A deep mutual trust, respect and understanding. I’m grateful for our team – and grow in my appreciation for each member with every passing day. We’ve just begun our journey, so these are the good old days. If you want to win, keeping track of the scoreboard is a good thing. By all means, go after revenue – by focusing on playing an excellent game. Humility, chemistry and culture are all fundamentals that will help you, your team and your clients win!